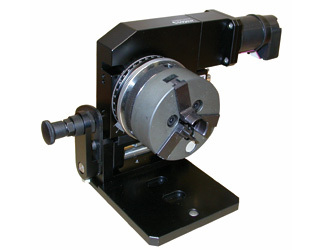 For labelling of cylindrical components it is possible to apply a rotating module. With this, 360° marking around the circumference of the workpieces to be processed will be possible. For that, the rotating module is controlled by the marking software that coordinates the laser and the rotating module. The software allows for marking of text and logos around the circumference in segments. In the same way, scales can be applied around the circumference.